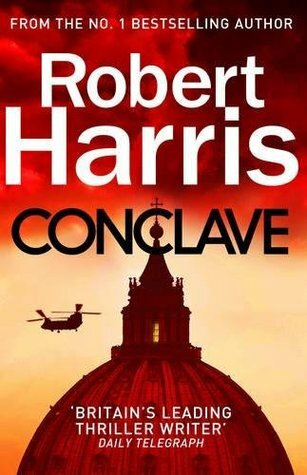 I really didn’t expect to enjoy Conclave as much as I did, but then I’ve enjoyed all of his books that I’ve read, so I shouldn’t have been surprised. Conclave is about an election of a Pope and I found it absolutely fascinating as the process of the election unfolded. Harris describes the procedure as Cardinal Lomeli, the Dean of the College of Cardinals leads the 118 Cardinals through the voting stages. I felt as though I was a fly on the wall watching it throughout as the Cardinals are locked inside the Sistine Chapel, isolated from contact with the outside world. It’s also dramatic as events in the outside world impact on the Conclave. I was completely engrossed and hoping that my favourite would be elected. Harris has thoroughly researched the subject and seamlessly woven the facts into the novel. He visited the locations used during a Conclave that are permanently closed to the public and interviewed a number of prominent Catholics including a cardinal who had taken part in a Conclave, as well as consulting many reports and books. There is one point that I found hard to accept (I think that to say any more would spoil the book), although it is something I’d thought might happen but I’d dismissed as rather fanciful. Nevertheless I still think this is a 5* book as I enjoyed it so much – one of the best books I’ve read this year. As I think I’ve said before, I gave up on Harris halfway through the Imperium trilogy. I found that just dragged on and on and on. However, having worked for the Catholic Church for half my adult life maybe I ought to give this one a go. I will at least know something about the world that it’s describing. I didn’t find Conclave dragged! I know very little about the Catholic Church, so if you do read it I’d like to know what you think. It certainly lived up to my expectations! I enjoyed this too – I had never expected a book about a conclave to be so exciting! I know which plot point you’re referring to and I completely agree. I had also suspected it earlier on and then thought I must be wrong. It’s still a great book, though, and I’m looking forward to reading his new one, Munich. I was surprised by how absorbing it was and yes, exciting! Harris did drop a few clues along the way, but I too thought I was wrong and that there must be a different explanation for a few things. I’m looking forward to reading Munich too. Totally agree! Harris really made me feel I was there and I found the whole thing utterly absorbing. Like you, I was rooting for my own favourite at each vote. And, like you again, despite the dodgy plot point, I still thoroughly enjoyed the book. What a writer he is! Not everyone agrees with us about his books! The Fear Index, a financial what-if taking place entirely on the day that the Blair-Brown years officially ended: 6 May 2010, election day, has such contrasting reviews on Goodreads, varying from 1 to 5 stars. The comments go from ‘This book was terrible’ to ‘it’s a hair-raising triumph’! It just shows reading is purely subjective. I’ve borrowed a copy from the library and hope I’ll think it is a triumph too.